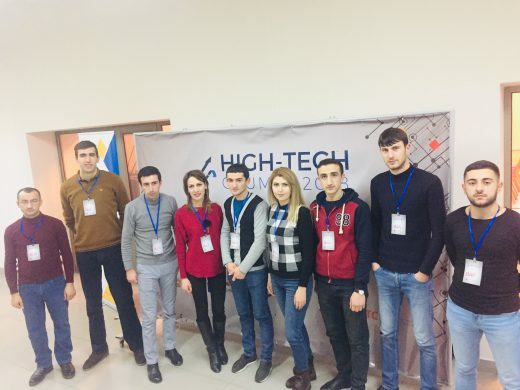 On December 7-8th, 2018, Gyumri Technology Center hosted the Second Forum entitled “Empowering Regions through High-Tech”. The forum was aimed at identifying opportunities and challenges from education to business, determining the role of the government in creation of business environment in the regions, presenting successful experience of Shirak region in the processes of high technology, engineering and education related fields, promoting business environment development in the regions as well as encourage networking, knowledge exchange among young people from all Armenian regions and tech communities in Armenia The Forum was attended by 10 young people from each region of the Republic of Armenia, representatives of state bodies and a number of local and international organizations. Head of Tavush region group was Slavik Alaverdyan, lecturer of the Department of General Mathematics and Natural Sciences of YSU Ijevan Branch, president of “Creative Youth Union” NGO. The third-year students of YSUIB Faculty of Informatics and Applied Mathematics (Full-time training) Gerasim Alaverdyan, Argishti Margaryan and Vazgen Paytyan, 5th-year student of “Service” specialty (Part-time training) Gevorg Amirkhanyan, YSUIB graduates, coordinator of “Jinishyan” Memorial Foundation Ijevan office, Harutyun Alikhanyan and Tavush Tourism Research and Development Center coordinator Narek Sardaryan, as well as Narine Danielyan and Nane Gasparyan, ‘Armat” Laboratory Officers and 3D animator Roman Abovyan took part in the Forum. Amalya Yeghoyan, regional high-tech development manager at Enterprise Incubator Foundation and the executive director of Gyumri Information Technologies Center made an opening speech. The presenters paid tribute to the victims of 1988 Spitak earthquake with a minute of silence. Director at Enterprise Incubator Foundation, Bagrat Yengibaryan, RA Deputy Prime Minister Tigran Avinyan, Head of the EU Delegation to Armenia Piotr Antoni Switalski, German Ambassador Extraordinary and Plenipotentiary to Armenia Bernhard Matthias Kiesler, Minister of Transport, Communication and Information Technology Hakob Arshakyan, Head of World Bank Armenia office, Sylvie Bossoutrot, USAID Armenia Mission Director Deborah Grieser, Deputy Coordinator of UNDP Armenia Dmitry Mariyasin, made a welcoming speech. The memorandum was signed between the Ministry of Transport, Communication and Information Technologies of the Republic of Armenia, the “YEA Engineering Association” NGO and the Union of Employers of Information and Communication Technology for the development of the technology sector in the regions. The memorandum was also signed between 4 private companies and Gyumri N4 state art school. On the first day of the Forum, three panel discussions were held on the following agenda: the challenges of international business in regions, promotion of entrepreneurship ecosystems in regions and the role of technologies in the development of those spheres. Some of the participants of the previous Forum presented their achievements and successes. During the first panel discussion, Director of “National Instruments”, Director of “YEA Engineering Association” Aram Salatyan, Head of “Philip Morris International” Research and Development Ecosystem Mariam Davtyan, Director of “Synergy Armenia” Anna Stepanyan and “VOLO” Company co-founder and director Armen Kocharyan, and CEO of “SME DNC” of Armenia, Arshak Grigoryan, made a speech and answered the participants’ questions. The speakers of the second panel discussion were “UEICT” Executive Director Eduard Musayelyan, “ISTC” Director Areg Gevorgyan, Director of “Blue Idea” Polish Company Tigran Amatuni, and Founder of “IT Space” company Karen Gasparyan, Co-founder of “Luseen Technologies” company Varazdat Avetisyan, Vanadzor Technological Center business development manager Patvakan Hakhinyan. Director of Synopsys Armenia Hovik Musayelyan also made a speech during the Forum. The “FAST” Foundation Acceleration and Incubation program officer, David Becket, “Brainforce” CEO Gurgen Gharibyan, “D-Link” Quality Assurance Consultant Aram Khachatryan and Mariam Babayan, the program manager of “Support to SME Development” in Armenia took part in the final discussion. The first day of the Forum ended with a dinner in “Di Napoli” pizzeria, where the participants from different regions had an opportunity to communicate with each other, to establish contacts and to discuss the upcoming plans, wishing success to the Forum and the process of empowering the regions through high-tech in Armenia. On the second day, the work of the Forum continued with parallel workshops and seminars. The participants were willing to choose which seminar they would like to attend. Director of “ISTC” Areg Gevorgyan presented how successfully create the start up. Director of “Deworkacy”company Julia Tumasyan held a seminar on “Design Thinking”. Director of “SHEMM” Center Tigran Minasyan thoroughly presented the issues of finance and business management. After the workshops and seminars, the guests of Gyumri were divided into four teams (Kumayri, Alexandrapol, Leninakan, and Gyumri) and through the game consisting of 3 dozens tasks (building names, information, pictures with cultural monuments, etc.) got acquainted with the city. The first was the team of “Alexandrapol” consisting of youth from Tavush and Syunik regions. Taking advantage of the Forum, representatives of Tavush region got acquainted with Gyumri Technology Center and a number of organizations operating in its territory, accompanied by the Forum volunteer Ara Gevorgyan. Bella Harutyunyan, Gyumri Technology Center Business Development Manager, made the final speech and handed the certificates to the partisipants. During the Forum, an agreement was reached to organize meetings with representatives of IT sphere in RA regions and summarize the results at the next Forum. All the photos of the Forum are available in the gallery.